I'm very pleased to have chosen ALBA Driving School. I had an excellent instructor, Blenti, who did fantastic job teaching me and keeping me calm and happy as I was driving. As a result, I passed my driving test with ease at Burgess Hill driving test centre. I would definitely recommend ALBA to others. Thank you! Joanna. Having already spent a lot of money on lessons with a larger driving school and failing my test with 20 minors and 3 serious faults after around 40 hours of lessons, I decided to go with a different driving school and I wish I had have chosen Alba in the first place. My instructor Lumi was absolutely brilliant! From the first lesson it was obvious how much Lumi actually cared about me passing my test and wasn't just concerned with getting paid at the end of it. He was honest with how well he thought I was progressing from start to finish and his teaching methods are second to none. He was patient and took the time necessary for me to understand how to become a better driver. Lumi was totally flexible with booking lessons and as I couldn't really do lessons during the week he bent over backwards to accomodate me and fit in long lessons at the weekend. It was clear that Lumi's priority was for me to get the absolute most out of every lesson and to pass my test when I was ready. It's worth mentioning what a lovely person he is too! It does make a difference if you have to do long lessons that the person you're in the car with is as pleasant and easy to talk to as Lumi is. I can't recommend this driving school and Lumi in particular enough. In the end after around 30 hours with Lumi, I passed with just 3 minors which was due to the confidence he had given me by ensuring I was a good enough driver before taking me to the test. So if you are thinking of going with a larger corporate driving school, don't be fooled by the TV commercials or fancy websites. Save your money and go with Alba, these people really care about you passing your test! I wish I had first time round! I'd like to thank Alba for helping me pass my driving test in Sutton Coldfield in December. My instructor was extremely professional, calm and patient. As a result I was able to relax and enjoy my time learning to drive and obtain my full licence in less time than expected. I would totally recommend Alba Driving School to anyone looking for great service and value for money. Keiran. As a '45 year old female learner' I had failed 3 tests over a period of 20 years. I was very nervous and lacked confidence, but Andy put me at ease straight away. He is very patient, calm & reassuring. His ability to explain & guide are second to none. After every lesson I came away feeling I had accomplished something new & confident that I was a step nearer to passing my test. 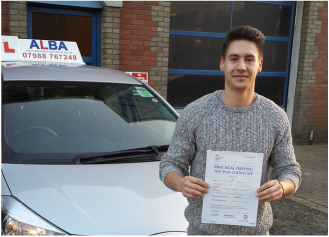 His knowledge & expertise are paramount to the first class driving instructor he is. After having just over 2 months tuition I Passed my Driving Test & its all thanks to Andy. I wouldn't hesitate in recommending Andy to friends & relatives who in the future decide they want to learn to drive. Thanks Andy you are a super star, you have given me the independence & freedom & a new lease of life. I feel very lucky to know you. Thanks again for all your help & support. Tracy Fowler. A big thank you to Andy for helping me pass my test first time! I felt under pressure to pass because both my sisters had passed first time with Andy, and they expected me to do the same.. which i did! Andy is a great instructor, he made me feel confident behind the wheel and was always calm and reassuring throughout the lessons. I never dreaded driving lessons like some of my friends do! I would definitely recommend Andy. Thank you again! Jordan Hodgson. Yeah passed my driving test first time. Thanks to you Blenti helping me from scratch passing the driving test on my first attempt, I earned a free driving lesson by recommending my relatives to ALBA absolutely great service. I just want to advice other people who definitely wants to pass their driving test, they should start taking driving lessons with you as you are seriously the best, so much patience, great attitude, motivational and most of all you always give a lot of praise & always KEEP calm! I am literally over the moon! Radha. Dr Asad, I passed driving test in an semi automatic car with ALBA driving school, my driving instructor Blenti he is very enthusiastic and calm driving instructor, he help me step by step to pass my driving test, I would highly recommend ALBA driving school to friends & family. Thanks Dr Asad. I was so nervous when I first started driving lessons but Andy is a very nice person and made me feel relaxed and very comfortable. Andy is great at explaining things and is very patient. I would recommend Andy Adkins from Alba Driving School to anyone who wants to learn to drive. Kind regards Tina. I passed my driving test on the first attempt with only 4 driving faults in South Yardley, and I only had 12 driving lessons from scratch. Hey guys Blenti is really the BEST driving instructor in UK. Thank you ALBA DS George. I started learning to drive with ALBA driving school as a beginner. Thanks to my instructor Blenti very professional, enthusiastic, patient and calm. He helped me step by step to pass my driving test with confidence and I could never felt any safer. I passed my driving test on the first attempt. I would highly recommend anybody to ALBA. Thank you so much Jora. I passed my driving test at Sutton Coldfield on 1st attempt. ALBA driving school has excellent driving instructors and ALBA driving school is one of the best driving schools, quality driving lessons guaranteed not wasting time and money, Many thanks Dritan. After bad experience I decided to change driving school so I give Alba driving school a ring, Thanks to Blenti I passed driving test first time in Shirley. Zaleika. Thank you so much Blenti. you are the best instructor, I passed my test 1st time in Sutton Coldfield, my life just got easier. Thank you so much Tendai. After few years driving abroad I wanted to get a full UK licence. A friend of mine recommended me Blenti, I had 5 lessons and went for my driving test and passed first time in Shirley, ALBA is absolutely the best driving school out there, Blenti Keeps it Short and Simple. Highly recommended, Thank you Pal. Thank you so many Jasmine. I just want to say thanks to Andy for being such a great teacher and letting me gain this great experience it was a privilege learning from you because of the patience you had teaching me and the way you taught me step by step to grow my confidence behind the wheel and become a better driver each time i was behind the wheel with you. Once again thank you very much. Stephen. Hi Blenti, I just wanted to say a great big THANK YOU for helping me pass my driving test today! It has taken me 10 years to achieve this, and I am so grateful - so many times I thought I didn't have the confidence or what it took to pass, but you stayed patient and worked with me to build up my confidence - have to say this is the best feeling in the world! Of all the instructors I've had in the past you've been the best as you never once shouted or raised your voice, you staying calm kept me calm! I will definitely recommend you to anyone I know who is learning to drive - so once again thank you so much for everything! Tina. I thought would never passed my driving test. Thanks to ALBA driving school, Blent help me step by step from scratch and I passed my driving test on first attempt at Sutton Coldfield, the examiner got a bit frightened when he saw me but as soon as the examiner got in the car he realize who my instructor was then he started to relax as we drove off and come back to the test centre the examiner said it was a very nice drive. I said thanks to my instructor, He is the best! many thanks Halima. Dr Rani, I passed my driving test on first attempt with alba driving school and took the pass plus motorway driving lessons course, great driving experience, I would highly recommend friends & family to ALBA, many thanks Dr Rani. Andy was supportive and patient; he made me feel very confident in my driving. He gave me the skills and confidence I needed to become a better driver, he was an excellent teacher and I am very happy that I chose him to be my instructor, I would definitely recommend anyone to ALBA driving school. Thank you Louise. I passed my driving test first time with only 4 minor faults in Kingstanding. Thanks to ALBA Driving School is best driving school in the country, by helping me not only to pass my test but teach me safe driving for life! Thanks Emma. I passed my driving test first attempt only 3 minor faults with Blenti ~ Alba driving School. Rafal failed 1st attempt as he took it with his own car, after bad experience he decided Have some professional driving lessons with Blenti & he was very happy of our service. I passed my driving test with only 3 minor driving faults in Shirley - Solihull! Thanks to Blenti, he is very enthusiastic and calm driving instructor, he help me step by step to pass my driving test, I had experience with other driving schools but after all no one compare to Blenti, I would recommend anybody to ALBA Driving School. Fantastic I passed driving test at Sutton Coldfield Birmingham, after three years of learning to drive and had four different driving instructors I decided to join ALBA driving school and after hard work I have passed my driving test today together with the help of my instructor Blenti who has been patient and is very knowledgeable. Compare with my other instructors who were not patient and smoking. After I passed my driving test I did the pass plus motorway driving courses absolutely worth doing it as I saved some money on car insurance, no one compare to Blenti, thanks a lot Harj. I passed driving test first attempt with alba driving school, Blent is an excellent driving instructors, I did an intensive driving course to get my confidence really worthy, I passed driving test at Sutton Coldfield in Birmingham, I would highly recommend anyone to ALBA, thanks Attiya. I passed my driving test with only 3 minor driving faults in Boldmere Sutton Coldfield thanks to Blenti, he is very enthusiastic and calm driving instructor taught me how to drive from scratch, after passing my driving test I did the pass plus motorway driving lessons courses great experience as it was scary at the beginning especially joining the motorway Exiting the motorway was not that bad as dealing with lorry driver was most danger thing when changing lane, Thanks to Blent by making it simple how and when to change lane while driving on high speed. My brother can not wait to start taking lessons soon as he is 17 & half with Blent. Thanks again John. It was wonderful learning to drive experience and specially My driving Instructor Mr. Wole encouraged me a lot to make it after couple of failure attempts and finally I made it. Now I recommend anybody willing to pass the driving test should contact Mr. Wole for maximised chances of winning ALBA Driving School. I passed driving test on first attempt in an semi automatic car at Boldmere in Sutton Coldfield with Alba driving school, I had best driving experience & I enjoyed every driving lessons with Blenti he is apsolutely the best driving instructors you can get. Thanks Beth. After bad driving experience with other driving instructors I could not see my self passing the driving test as I was driving every day in the same road at 20 miles per hour zone so I decided to change the driving instructor, A friend of my who recommended me ALBA driving school, my driving instructor Blenti he was very calm helped me especially with dual carriageway as I did not like the high speed and the manoeuvres he makes it really very easy how to do them, I passed driving test at Boldmere in Sutton Coldfield, I would very highly recommend anyone to ALBA driving school, thank you very much Lula. Had to change few driving instructors as many of them were wasting my time as well they were shouting at me during the lesson when I made a driving fault they seems were not interested, so I decided to join alba driving school and I was happy that I join alba driving school, I passed driving test at Boldmere in Sutton Coldfield, thanks you Sarah. 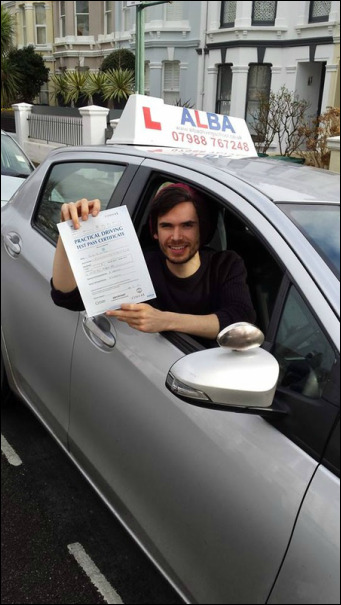 Alba driving school was recommended to me by a friend of mine, I passed driving test first attempt at Boldmere in Sutton Coldfield, do you need to pass driving test! To get your driving licence then call ALBA driving school, guaranteed the best driving instructors no wasting your time, Thanks to ALBA Fatjon. With thanks to Blenti at Alba driving school, I passed my driving test first time. I would definitely recommend Alba to anyone looking to take lessons. I was grateful to receive calm and friendly teaching from Blenti, which helped me to become a confident driver and pass my test with ease. I passed driving test with ALBA driving school, if you do not want to waste your time then ALBA is the perfect answer 4 you, choosing a driving instructor is not easy that why I started to take driving lessons with alba driving school, Highly recommended by friends. Thanks Arvit. Thanks Blent I could not have passed my driving test without you. After bad experience with other driving instructors / driving schools no one compare to you. You are the best! I would make sure recommending friends and family to you, Thanks Emma. I passed my driving test with only 2 minor driving faults at Sutton Coldfield. Blenti he is very enthusiastic and calm driving instructor, he help me to pass my driving test, I had experience with other driving schools but after all no one compare to Blenti, Alba driving school was recommended to me by FRIENDS. I would recommend anyone to ALBA Driving School. Thanks Marion. I started learning to drive with ALBA driving school as a beginner driver thanks to my professional driving instructor who help me from scratch with only 25 driving lessons I passed my driving test first attempt, ALBA Driving School is the best! Natu. I wanted to do a quick intensive driving course so I give ALBA a ring and booked an assessment driving lesson I was thinking to do about 25 lessons but after my assessment lesson Blenti advised I only need 20 lessons so I took his advice thanks to him I passed my driving test first time. Thank you so much Haylee. I passed my driving test first attempt with ALBA driving school absolutely great service, I think my driving instructor Blenti is one of the best driving instructors you can get out there, highly recommended by friends and family. Thanks Berti. A friend of mine Bubocar recommended ALBA. Very very big thank you to ALBA driving school. Blenti is a very calm and encouranging driving instructor. His professional manner of help me to pass my test confidently at my first attempt. I'm very happy and will absolutely recommend friends & family to choose ALBA driving school. Lang K.
I'd like to thank Alba for helping me pass my test first time,especially a great thanks to Blenti for teaching me to drive and making me have extra lessons before my test which paid off. I had 23 lessons before my test and passed first time, I would definitely tell other people to go with Alba driving school. Just to say that my driving tuition (Cheshunt in Hertfordshire) was splendid, I enjoyed every bit of it and will recommend my instructor to friends and family because he has those skills and patience to anybody would ever want. I am really happy to have Andy as my instructor, he is amazing. Mary Okafor. After two cancellations we had from DSA because of examiner's strike & bad weather we finally managed to get the test done today and we did in style, a great first time pass, thanks to Blenti, many thanks Kelly. I passed my driving test first time with only three minors thanks to Andy. He is a great instructor, very patient and takes away the nerves that every new driver feels when they first get into a car. I really couldn't have asked for a better instructor! Thank you so much Andy. Thanks to Blenti. I passed my driving test in no time. In the beginning I was so nervous sitting behind the wheels and he made me relaxed. He taught me all the skills that I needed to be a good driver. Thank you Blenti I appreciate all your help. I would definitely recommend Blenti of ALBA Driving School to anyone who want to learn to drive. Eva. Hi Andy, I just wanted to say a big THANK YOU for helping me pass my driving test today at Enfield driving test centre. You're such a great instructor to learn with, you've always been professional, patient and calm with me for the last 2 years that I have actually been learning to drive with you, never once have you made me feel like I should give up and you have always believed I could do it and made me feel so confident behind the wheel. LEARN WITH ANDY BY FAR THE BEST INSTRUCTOR!!!!! THANK YOU SO SO MUCH! Lauren. We keep it as simple as it can be. Whether you choose manual or automatic driving lessons, intensive driving courses. If you really want to pass your driving test? 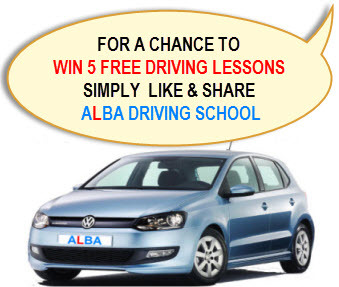 Then call ALBA Driving School now.